10 3.5 EID 50/ dose. Each 5ml or 20ml vial contains 100 doses of freeze dried vaccine. The vaccine can be stored at – 20 0C. The wing web should be slightly stretched. 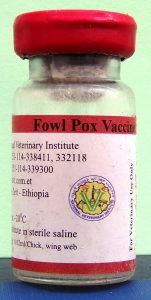 – Vaccinate only apparently healthy chicken.